Having a good flashlight can really help out, not only in everyday situations (like walking to your car in the dark), but also out in the wild where there is limited (if any) unnatural light sources. Check out our listing of the best EDC flashlights for 2019! This is a small, lightweight, but powerful flashlight with the five different light modes: low, medium, high, strobe, SOS. It also has a wide area focus option and a focused beam option. This flashlight has power options of either 1 18650 lithium ion rechargeable battery, or 3 AAA batteries. This flashlight can be completely submerged in water for a short period of time. This flashlight is a bit bigger and heavier than some of the others listed, but it’s hard to complain for the price, and the fact that you get two for the price of one. You can use a lithium ion rechargeable battery of 3 AAA’s, and this flashlight have five light modes, and the focus of this light can be adjusted. It can also be used in heavy rain. This flashlight is very portable, comes with an option to use 1 battery or 2, and has 2 different standard usage modes: indoor or outdoor. In outdoor mode, this flashlight has 6 different light modes: eco, light, medium, high, turbo, strobe and SOS. This flashlight can be completely submerged in water up to 6.5 feet for 30 minutes. What’s the difference between an EDC flashlight and a regular flashlight? Why do you need an EDC flashlight? 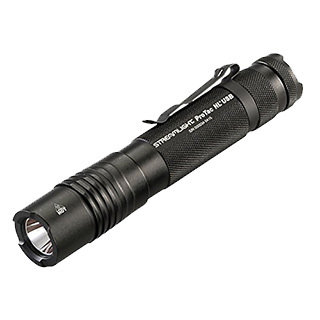 At only 4” long, with a lightweight aluminum body, this flashlight is very portable. It has three light modes, an LED bulb and runs off of one AA battery. The three light modes offer flexibility in brightness and duration: low at a duration of 40 hours, medium at a duration of over 6 hours, and high. With its varying brightness modes, this flashlight is good for anything from searching for your keys, looking for firewood outdoors, or searching for your hiking path. It’s different brightness modes also mean that the flashlight can last for up to 40 hours at low light, which is reassuring for usage in emergency situations. It’s LED light also assures that this flashlight will last for a long, long time. It’s made from durable aircraft-grade aluminum, and has an IPX rating of 8. It’s waterproof for up to 2 meters at 30 minutes. This flashlight is similar to the Fenix E12: it’s aluminum, lightweight, and has three modes. That’s where the differences start: this flashlight has a low, high, and strobe mode, making it better for emergency signalling. At 300 lumens, this flashlight reaches a distance of up to 600 meters. It’s both waterproof and shockproof. It’s lightweight and at only 4.2 inches, it’s very portable. It takes one AA battery. This flashlight is great for searching for keys, being outdoors, and calling for help in an emergency. • Only 300 lumens, it’s not as bright as some of the others listed. This is another small, lightweight, LED flashlight. It runs off of one AAA battery for up to 2 hours and 15 minutes. The LED bulb has a 30,000 hour duration. It’s 28 lumens reach up to 52 meters. This flashlight is water resistant to splashes of water and can withstand the impact of a 1 meter drop. This is the lightest flashlight on our list so far at a weight of only 1.12 ounces, and the smallest at only 3.5”. It also has the lowest lumen count so far, meaning it’s not as bright as the others. Because of its only 35 lumens, this flashlight works best for searching for keys, or anything else that is at a close distance. This flashlight is a bit more expensive than the others on the list, but it also has lots of features that the others don’t. This is another aluminum flashlight, but it’s heavier at 7.2 oz. It has three modes: low, high, and strobe. It can be programmed for only high mode, and also medium. The LED bulbs in this flashlight last for up to 100,000 hours, and can run for 7.5 hours continuously. With an IPX rating of 4, this flashlight can withstand splashing water and can be dropped from 1.5 meters without damage. This flashlight works well in emergency situations, for outdoor or indoor use, and can be used for self-protection purposes for disorientating people with its bright light. This flashlight is bigger at 6.1’ and heavier at 11.4 oz than the others listed, as its made of aluminum and steel. It also has more features. It has the highest IP rating so far: 65, as it’s designed for use in heavy rain. It comes at a great price and there are two flashlights per package. As a power source, this flashlight can take either 3 AAA batteries (included) or 1 18650 lithium ion rechargeable battery. This flashlight has five modes: low, medium, high, strobe, and SOS. You can adjust the focus of the spotlight on this flashlight for up observation of up to 600 feet. While it may be somewhat heavy for everyday carry, this flashlight can be used in all kinds of everyday situations, indoors and outdoors, and is also suitable for emergency situations and sending out SOS signals. The LED lights in this flashlight can last for up to 100,000 hours. This flashlight is a good size and weight for an everyday carry flashlight. Unlike the others in its size and weight category, this flashlight has five brightness modes: low, medium, high, strobe, and SOS. It’s water and skip resistant, and it’s 18650 lithium ion battery is rechargeable with the included charger. It takes about 6 hours to fully charge this flashlight, and there is an option to use 3 AAA batteries instead of one lithium ion battery. Unlike all the others listed so far, this flashlight is zoomable, so the light can be focused. There are five zoom modes: 1x, 250x, 500x, 1000x and 2000x. Its beam can go up to 500 meters. The LED bulbs used in this light last for 100,000 hours. Because of its five different brightness modes and zoom modes, as well as its lighter weight and smaller size, this flashlight can easily work as an everyday carry flashlight and a flashlight for emergency situations and sending SOS signals. This is another small, light, but powerful flashlight with the five different modes: low, medium, high, strobe, SOS. Again, this flashlight has power options of either 1 18650 lithium ion rechargeable battery, or 3 AAA batteries. Unlike the others, this flashlight can be completely submerged in water for a short period of time. While the PeakPlus has more zoom modes, this one does have a wide area focus option and a focused beam option. This is the most expensive and impressive flashlight on our list so far. It’s light, small, and made of aluminum, like many of the others. It can use 1 18650 lithium ion rechargeable battery, or 2 CR123A lithium batteries. What sets it apart is its brightness features. This flashlight can be toggled from tactical mode to outdoor mode. In tactical mode, it can be used for 1 hour and 10 minutes on turbo mode which use 1000 lumens, or it can be used on low at 60 lumens for almost 30 hours. There is also a strobe mode. Toggle the flashlight on to outdoor mode, and suddenly you have 6 different light modes, which last from 1 hour to 140 hours on eco mode. Eco mode is one we haven’t seen on this list yet. It uses only 8 lumens and can last for 140 hours. Turbo is another new one, which lasts around 1 hour. Another feature that sets this flashlight apart is the fact that it can be completely submerged in water up to 6.5 feet for 30 minutes. All of these features mean this flashlight is great for indoor use, outdoor use, and in emergency situations, or when SOS signals are needed. The only thing this flashlight is lacking is focused beam (or zoom) modes. This flashlight is very portable: it’s small and lightweight, but has many of the features of the slightly heavier and larger flashlights on this list so far. Though this flashlight doesn’t take rechargeable lithium ion batteries, it does take 3 AAA batteries. There are three brightness modes: low, high and strobe, as well as wide-to-narrow beam zooming modes. You can use this flashlight to focus on items up to 800 meters away. This flashlight is also water resistant as it can be submerged in water for a short period of time and can be dropped from up to 9 feet without being damaged by the impact. This flashlight is good for everyday carry usage, as well as indoors, outdoors, and in emergency situations. An EDC flashlight is great for carrying around with you for everyday use, just like your keys and phone. flashlight you would keep at home. Since you’re “carrying” it around “everyday” in your pocket or purse, it needs to be light and small but just as bright as a regular flashlight. Let’s address the elephant in the room: Yes, your phone DOES have a flashlight. If you really need a flashlight and your phone is handy and has enough battery, of course you can use it as a flashlight. when it’s likely your phone may be losing battery. EDC flashlights are also great for hiking, camping, and other outdoor adventures, because, like so much other gear we carry, they’re portable. Brightness: the lumens, bulb type, and beam features of your flashlight will determine how bright it is. Material: this influences how lightweight and portable your flashlight will be. It will also influence how durable it is. Battery type: the type of battery your flashlight determines how long you can use it without having to worry about changing the battery, and will contribute to cost as well. Water and shock resistance: the durability of your flashlight will be determined by whether or not it is water or shock resistant. Modes: some flashlights have more than one brightness mode. Let’s focus on brightness because there are lots of different options and lingo when it comes to the brightness of a flashlight. Lumens are the measurement of the total amount of visible light from a light source like a flashlight. The higher the lumen count, the brighter the light source. Basic flashlights have 10 lumens, and higher-end, more specialized flashlights (like search and rescue flashlights) can have up to 18,000. Bulb type is an important consideration in battery life, because the type of bulb will determine the energy efficiency of the flashlight. Most flashlights are either made of plastic, aluminum, or steel. If you’re planning to use your flashlight for emergency purposes, it’s important that it be water and shock resistant. This can be determined by looking at a flashlight’s rating on the IPX system: IP stands for (Ingress Protection). The higher the IPX number, the better protected it is against water, dust, and shock or impact. Most flashlights have only one setting, which is good for normal use, but some models may have more than one setting. Are you getting ready to start a new adventure? Mike’sGearReviews will help you with your check list: Do you have a Survival Water Filter? Did you get your hiking pants? How about the fire starter?…and you can also read our Zombie Survival Guide, because… you never know!